Karina's Kreations: LNS Treasure Hunt and Blog Hop Fall 2013! LNS Treasure Hunt and Blog Hop Fall 2013! 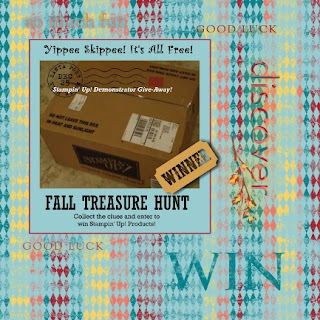 I have joined a Late Night Stampers Fall Blog Hop and I invite you to join the fun! One lucky person will win Stampin'Up Goodies! My Clue is Glue Dots! The Mini glue dots are perfect for card making, scrap booking or other crafting projects. There is no mess, no fumes or drying times for this product! It's perfect for heavier embellishments like buttons or ribbon. 1)Visit my page at the top of my blog titled LNS Treasure Hunt Participating Blogs. 2) Check out each blog & look for the treasure hunt box and write down the name of the blog and their participating clue. It's always nice to leave a comment! 3) Email me at kchin2@telus.net by Oct 25th with the blog names & 50 clues as well as your name and email address. For example my blog name is Karinaskreation.com and my clue is Glue Dots! Leave me a comment on this post and I will enter your name to win a prize from me! I would love to give you a Merry Little Christmas Simply Created Card Kit! This kit includes everything you need to make 8 cards. All you need to do is supply the greeting! I hope you have fun playing!!! Sure can't live without mini glue dots! Thanks for a fun blog hop! I've enjoyed looking at all your creations. Having a fun time hunting for clues - thanks! Karina you have an awesome blog. Spent a lot of time checking out some of your posts and will definitely be back. Thanks for joining in the LNS Fall Treasure Hunt. Oh and I love your clue - Glue Dots, I couldn't create without them! Have a happy stamping week. Great blog! I am really enjoying this blog hop! Loving your cards and projects! Lots of wonderful inspiration! Smiles. Thanks for being part of the Treasure Hunt! Glue Dots are a must-have!